Custody issues are common between separated parents, and custody itself is complex. But what's best for the kids is worth pursuing. Keep the lines of communication between you and your ex open and positive so you can possibly strike a custody agreement without involving the court. And whatever you do, keep the kids out of it. Living between two homes is tough on kids. As much as you and your ex would like to keep adult things between adults, there are just some times when your kids may get caught in the middle. 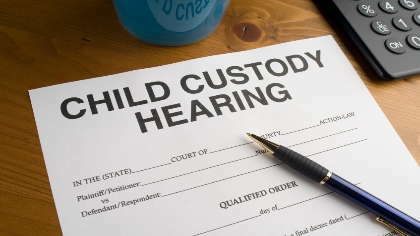 Custody, in particular, can get tricky. Most of the time it feels like someone is the winner and someone in the loser when it comes to custody. Custody has a way of causing adults to fight. When custody issues come up, it's important that you try as hard as possible to keep the peace. This doesn't mean that you have to give everything over to your ex or get stuck with hardly seeing your kids. It simply means that if there is a peaceful solution, try and find it. However, some people are just impossible to work with. In those cases, you may need some extra (legal) help. Your divorce decree or your custody agreement may not cover every scenario that arises in life, so what do you do? Maybe Father's Day or Mother's Day falls on one of the days you don't have your kids. If you want to spend time with your kids on that day, but it's not in the custody agreement, what are the options? First, it's important to stay in friendly communication with your ex as much as is possible. This way, if you have a "favor" to ask, there isn't immediate resistance. Open lines of communication will help tremendously when custody issues arise. Second, give your ex ample time before you need to make a temporary change in custody and offer some ideas for exchanging time or making things "even" once again. This is especially true if you don't have joint custody. Custody issues start with joint versus sole custody. Typically, both parents want to share custody of the kids, even if the kids have a primary residence with one parent or the other. Each case is unique. If you decide that you are not happy with the custody agreement, major changes will need to be made through an attorney and by petitioning the court. However, if you have an amicable relationship with your ex, it's possible that you can strike an agreement just between the two of you. However, if it is not made legal, it can be revoked by the person who has the greater measure of power, at will. One thing that judges may consider is the "status quo." This means if you have been living outside of the custody agreement for a long time, and your kids have grown accustomed to it, it may be that the judge sets it into custody himself. In just about every custody case, the judge will do what he or she feels is best for the kids, rather than what the parents think is best. So, it would benefit parents to try and work out what they can on their own. Whatever you do, don't involve your kids in custody issues. Don't let your kids hear you complain about how unfair things may be and don't ask them to approach your ex to request more time with you. These actions will make your kids feel like you've forced them into the middle of an argument that is not theirs – and it will hurt them. If you've tried everything you can think of to navigate a custody issue peacefully but are getting nowhere, call an attorney. It helps to have a record of any phone calls, emails, texts or conversations you and your ex have had about custody, especially if promises were made, in case the story changes later on.